The controversy over the effects of increasing levels of carbon dioxide (CO2) on nature -- and the fossil fuel combustion that contributes to it -- continues to intensify. Despite solid evidence to the contrary, many media reports speculate that increasing CO2 levels will result in apocalyptic global warming and eventual environmental disaster. In The Greening of Planet Earth Continues, expert scientists assert that CO2 is not a pollutant, but a nutrient to life on earth. The video further explores issues addressed in our first video, The Greening of Planet Earth, which has been distributed to more than 30,000 people worldwide. Learn the facts about climate history and the problems with computer simulations used to predict the impact of increasing CO2 levels. Discover what increasing CO2 levels really mean -- faster plant growth, greater agricultural yields and improved water-use efficiency in plants. 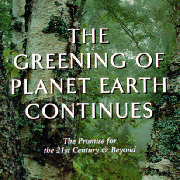 Evidence shows a picture of the ongoing industrial evolution of humankind as the greeing of planet earth continues.